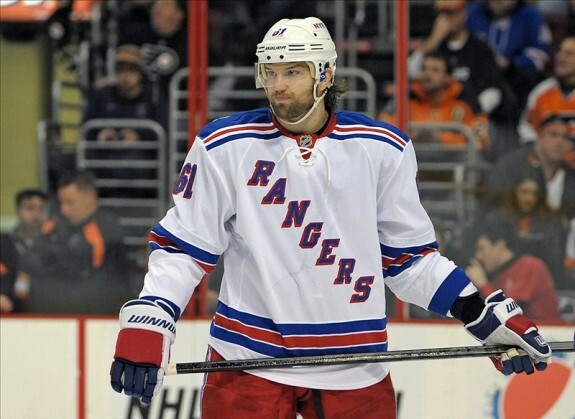 What if the New York Rangers Knew How to Score on the Power Play? With the same number of opportunities, how many more goals could we have expected to see from the Rangers if they had a decent power play? Let’s take a look at the Rangers’ seven losses to see just how much their power play struggles have hurt them, and how even a small improvement could have made a big difference in the standings. Neither team’s power play was ready to start the season. The Rangers (0-for-5) and Bruins (0-for-7) combined for eleven squandered power play opportunities in the first game of the season for both teams. The Rangers first chance lasted only a minute – with one shot on goal – before Brian Boyle went off for goaltender interference. Their second chance, now down by a goal, went the full two minutes with only one shot. Just 14 seconds after Daniel Paille scored to give the Bruins a 2-0 lead, the Rangers had their third power play opportunity. There was only one shot on goal during that time, and it came from the Bruins’ Johnny Boychuk, shorthanded. 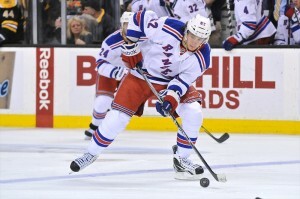 The Rangers’ best chance came early in the third period with the score 2-1. Thanks to penalties taken by Lucic and Chara, the Rangers had a 90-second two-man advantage. The team was only able to muster two shots on goal and were never able to find the equalizer, falling 3-1. Better Power Play? The Rangers tie the game at 2-2 in the third. Boston has outscored their opponents 18-6 in the third this season, so while the Rangers make a game out of it, Boston still goes on to win. The Rangers’ first power-play goal of the year came midway through the first, when Ryan Callahan put the puck past Tomas Vokoun to tie the game at 1-1. 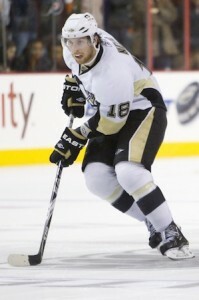 Unfortunately for New York, the Pens would score two more to take a 3-1 lead before the Rangers saw another power play. They were able to generate some chances, with three shots, though none found their way to the back of the net. Pittsburgh kept on scoring, putting the game out of reach at 5-1 in the third. The Rangers battled back, eventually getting as close as 5-3. They had one more power play opportunity to get within one but could not convert, only getting one shot on goal. Better Power Play? It would’ve been close, but the Rangers still lose this one. Their power play goal got them on the board, but the Penguins were too good in this game for the Rangers to recover. The Flyers played a surprisingly disciplined game, keeping the Rangers off the power play until the third period. When Braydon Coburn went off for high-sticking, though, they finally converted, trimming the Flyers’ lead to 2-1. The Rangers’ best chance to tie came at the midpoint of the period. With Tye McGinn already serving a double-minor for high sticking, Nick Grossman went off for hooking to give New York a full two minutes of 5-on-3 hockey. Only three shots on goal were even attempted during those crucial 120 seconds, with one blocked and two stopped easily by Bryzgalov. Better Power Play? Rangers tie it up in the third and score the go-ahead goal in regulation. The Flyers have given up 19 third-period goals, second most in the league, and that’s the Rangers’ strongest period. A well-timed power play goal – or two – would have made the difference in this one. WIN. Pittsburgh jumped on the scoreboard quickly, with Evgeni Malkin beating Lundqvist just 1:24 into the game. The Rangers, though, would have a few opportunities to tie the game. The Blueshirts went on the power play at 12:01 of the first but managed only one shot on goal – a blue-line slapshot from Anton Stralman that was turned aside. Their next power play chance came in the second period but they were held without a shot on goal when Michael Del Zotto negated the advantage altogether by hooking Brandon Sutter. The Rangers had one more attempt in the second when Dupuis went off for tripping. This power play actually generated some chances, with four shot attempts – three that made it through to Vokoun. The Pens would score in the first minute of the third to extend their lead to 2-0. The Rangers would be unsuccessful at one more power play to try to get back in it, ultimately being shut out by a score of 3-0. But what if they’d actually converted? Better Power Play? Three of their power play opportunities came at a time when a goal would have evened the game at 1-1. Going 1-for-4 on the man advantage would have likely tied the game. The Penguins are undefeated (8-0-0) when leading after two periods this season. Going into the third tied would at least give the Rangers a chance. Ultimately, the Penguins were outplaying the Rangers and it would have likely ended that way on the scoreboard. This one would still be a loss, but not a shutout. In the Rangers’ first game against their cross-river rivals, they had the chance to score first thanks to an early penalty by Dainius Zubrus. The Devils outshot the Rangers 2-1 on the ensuing power play, generating more shorthanded than the Rangers could with the man advantage. After Adam Henrique gave the Devils a 1-0 lead, the Rangers had two separate power play opportunities to tie things up – one of them a four-minute double-minor. In the combined six minutes of power play time, they managed only two shots on goal. The Devils penalty kill helped sparked the team, who scored shortly after the penalty expired to go up 2-0. With only three shots on goal over eight minutes of power play time, it’s not surprised that the Rangers were unable to convert. But if they had? Better Power Play? With five opportunities, the Rangers would have needed to convert only once to tie the game. The Clarkson goal, another that came on the heels of a big penalty kill, wouldn’t have happened – at least not then. Toss up. We’ll say that, going into the second tied, the Rangers force overtime and lose in the extra period. OVERTIME. The Rangers were leading the Islanders 2-1 when Eric Boulton went off for tripping. Just under 90 seconds later, Frans Nielsen joined him in the penalty box, giving the Rangers a short two-man advantage. With four shots on goal and two blocked, the Blueshirts were pushing on the power play, though they were yet again unable to convert on the two-man advantage. The Isles were able to hang on and keep the Rangers from adding to their lead. Just 12 seconds after Nielsen’s penalty expired, Tavares scored to tie the game. Riding the momentum, Brad Boyes gave the Islanders a 3-2 lead just 40 seconds later. After tying things up on the power play in the third, the Rangers had a chance to regain the lead, when defenseman Joe Finley high-sticked Brian Boyle. Unfortunately, the first unit couldn’t get anything going. They were held without a shot; only Anton Stralman and Taylor Pyatt were able to get shots through in the waning moments of the man advantage, but neither eluded Islanders goaltender Evgeni Nabokov. The Rangers went on to lose to the Islanders in a shootout, giving up a very important point in the standings. Better Power Play? Rangers regulation victory. Scoring during their 5-on-3 or during either of those overlapping penalties would have given the Rangers a 3-1 lead. The goal also would’ve stopped the momentum of the Isles, whose play was improving during the period. The Isles are the only team worse than the Flyers with third-period goal differential, clocking in at -11 (15 scored, 26 given up), so the Rangers would have likely added to their lead. WIN. The Rangers jumped out to an early lead before the Canadiens tied the game with less than two minutes to play in the second. Montreal took the lead early in the third, but the Rangers weren’t out of it. After a terrific penalty kill, the Rangers had less than five minutes to even the score. Helping in their quest was a tripping penalty called on Tomas Plekanec that gave New York a man advantage. It wasn’t much of an advantage. The team registered a lone shot on goal before Raphael Diaz sent the puck into the empty net to seal the Habs’ victory. Better Power Play? Overtime. The way this game was going without any steady flow, it’s hard to call who would get the next bounce. It’s likely, though, that nothing would’ve happened in the remaining few minutes of regulation. Let’s say they at least get a point out of it. OVERTIME. In these seven losses, the Rangers went a combined 3-for-28 on the power play, right in line with their season percentage of 10.9%. In a total of 46:32 with the man advantage, the Rangers’ have only scored 3 goals. Just a few timely conversions would make a difference. Even if the majority of these would still be losses, with a decent power play, the Rangers should have been able to claim two of these games as wins and earned at least one more point by forcing overtime. Doing so would have given them 23 points. They would have vaulted ahead of New Jersey and Pittsburgh to the top of the Atlantic Division, where they’d be within striking distance of the Eastern Conference lead. The power play won’t solve everything, but it can help overcome other struggles on the ice and give the team another option for when they do fall behind in games. Until they can begin to better take advantage of their power play chances, they’ll continue to miss out on opportunities to win. This season is too short to continue to let those slip away.